One support element of the production platform on SCHEUERLE SPMTs. For loads with high centres of gravity, SPMTs from the TII Group demonstrate their strengths to full effect and ensure a very high level of safety through precise electronic control. By 2016, the Cygnus gas field should account for five per cent of UK gas production thus supplying 1.5 million households with energy. 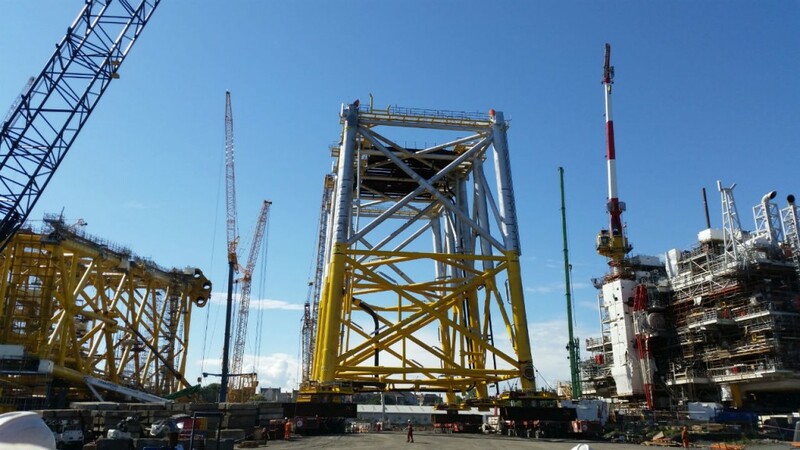 Delays in projects of this size are extremely expensive which is why the operator, GDF SUEZ E&P UK decided in favour of the vast experience of ALE along with the company´s superb range of transport equipment. Thanks to these two factors, the transportation of all five components went very smoothly although, among other things, the route included overcoming an inclined stretch of road with a three per cent gradient transverse to the direction of travel. On arrival at the quayside, the components were loaded onto a waiting barge and then transported to their final destination in the southern North Sea.